The rules and regulations of many triathlons allow the wearing of wetsuits and, depending on water temperatures, they are sometimes required. It is imperative to acquire a wetsuit well before your event in order to try it. You’ll want to try swimming in it as well as removing it for the transition. Wetsuits are great for buoyancy and warmth, but for some, wearing a wetsuit can cause a feeling of constriction, which can cause anxiety. Practicing in your wetsuit (whether in a pool or open water) will help you feel more comfortable wearing one in the water. Goggles are another essential piece of equipment for open water swimming. And (as with any race) you don’t try something new the day of the event! Leaky or foggy goggles can cause difficulty with sighting, which is stressful and can even steer you off-course. Wearing goggles that are tested and true can be the difference between a successful swim and a not-so-successful one. While it can be difficult to take scissors to your fancy, expensive wetsuit, the ease with which you’ll be able to remove it and the resultant time savings in transition are often worth it. Most races give out caps specific to the race, which designate the wave one is racing in. That’s fine, but if the water temperature is cold, wear another cap underneath your race cap to keep your core body temperature from dropping. Checking out the course prior to the race, and if possible swimming it, are extremely beneficial when it comes to alleviating pre-race nerves. Take note of any landmarks or objects on the shore to help with sighting, and be sure to memorize the position of the buoys, especially the ones that designate turns. 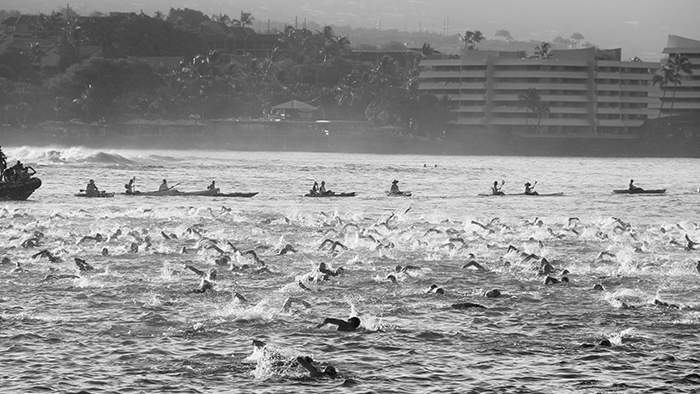 At the start of the race, take a position on the sides or in back of the group to avoid getting into the fray at the beginning of the swim. This will also give you an opportunity to find someone to follow or draft off of. Watching the pros or the group ahead of yours is a great way to figure out which positions are the best. The initial excitement and adrenaline at the start will cause a surge, but then you should settle into a pace which feels “comfortably hard” and try to maintain this throughout the swim until the finish is in sight. Sighting during the swim is important for keeping on course and maintaining a straight line, but lifting your head will cause your hips and legs to drop, which creates harder work. Try to sight every 5—7 breaths, and use “alligator eyes” to lift your head forward a minimal amount—just enough to see—before turning to the side to breathe. It is always an option to take several breast strokes if you can’t see the buoys or feel panicked. The time lost by using a slower stroke for a short time will often be made up by staying on course and relaxed. Drafting, or following just behind another swimmer, will result in less energy expended and often a faster time. As with biking, energy savings can be up to 30 percent! The best way to draft is to swim right behind a swimmer who has a similar or slightly faster pace. The best position is right “on their feet” and in their slipstream, but try to avoid tapping their toes. At the end of the swim pick up the pace of your kicking to increase the blood flow in your lower extremities, increase your heart rate and, of course, finish fast! This will help prepare your body to move from a horizontal position in the water to a vertical walk or run into the transition area. Swim as far into shallow water as possible. This will minimize the resistance caused by running through deeper water. Be careful when standing up, as some dizziness may occur. It’s a good idea to practice getting in and out of the pool after swimming fast during training to get used to this feeling. Finally, run to the transition as quickly as possible while removing your wetsuit. Once to the transition area, you can remove your wetsuit and celebrate that the swim is over! You are off to a great start! 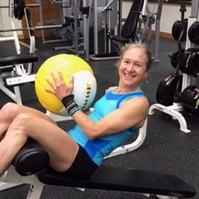 Pam Crandall is a USAT Level 1 Triathlon Coach, USMS Level I and II Masters Swim Coach, and a current USAT All-American. She coaches primarily women, working with all different skill sets and fitness levels to help her clients reach their goals and live healthier lives.